Letter from Mother telling me of the death of 3 officers and 2 men of the Buffs [The Royal East Kent Regiment. Edie’s family lived in Deal on the East Kent coast. Ed] – I knew quite well – the one I feel saddest about is Pte Ernest Wanstall. He cleaned our boots when he was quite a tiny – then grew big enough to take a place as chicken boy to a farmer’s wife, then he ran away and enlisted in the R.M.L.I. and came home a week later in his uniform, a funny little object, but the joy of his mother; she grew more and more proud of him as he filled out and was drilled into a fine upright fellow, so he progressed and was always the same nice, shy boy, very devoted to all of us. Now he is shot dead somewhere in France! 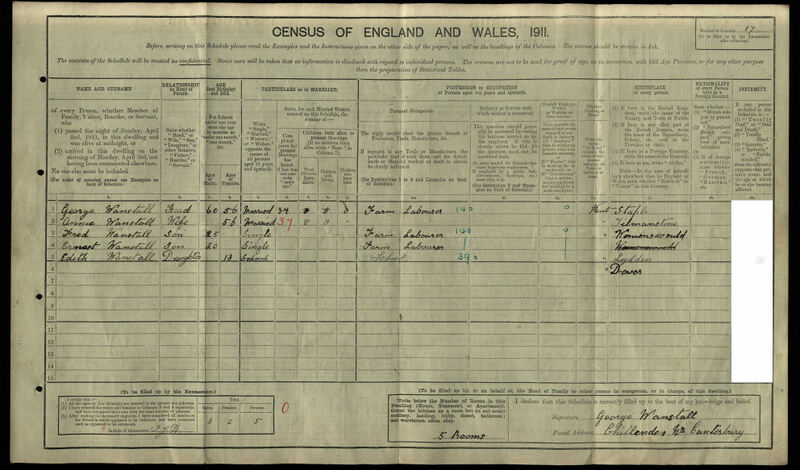 I am not certain, but this may be the same Ernest Wanstall mentioned in the 1911 census page below. If anyone can confirm this or knows otherwise please get in touch by emailing me at ediesdiaries@gmail.com. Strangely, I have been unable to find any mention of Ernest Wanstall on the CWGC website. Again, if any one can help please do contact me.